Llandovery/Llanymddyfri TownLlandovery is delightful little town at the northern edge of Carmarthenshire. The name Llandovery means 'church amongst the waters', owing to its position in a valley where the rivers Towy, Bran, Gwydderig and Bawddwr coincide. It is a traditional rural Welsh market town which was once on the drovers route and today, the annual Sheep Festival in September provides a charming introduction to sheep farming and the wool industry; it includes sheep dog trials, sheep shearing demonstrations and arts and crafts. Many visitors come to Llandovery to use it as a base for exploring the wonderful Carmarthenshire landscapes which neighbour the town. Llandovery has achieved 'Walkers are Welcome' recognition making this town an attractive destination for walkers. You can except to find excellent walking opportunities and top quality information on local walks. To the east of the town lie the Brecon Beacons National Park, the Fforest Fawr Geopark and the Black Mountain, a haven for walkers, nature enthusiasts and adrenalin junkies alike. To the west lies the Pembrokeshire National Park with its famous sweeping beaches and rolling hills, whilst to the north are the stunning vistas of the Cambrian Mountains. 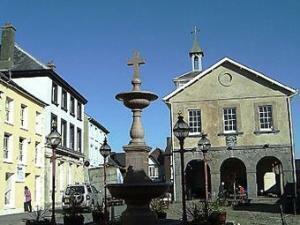 In Llandovery itself there are a number of things to do and see. The Heritage Centre charts the history of the town and its associations with the Romans, the Normans and the gold mines at Dolaucothi. Llandovery is delightful little town at the northern edge of Carmarthenshire. The name Llandovery means 'church amongst the waters', owing to its position in a valley where the rivers Towy, Bran, Gwydderig and Bawddwr coincide. It is a traditional rural Welsh market town which was once on the drovers route and today, the annual Sheep Festival in September provides a charming introduction to sheep farming and the wool industry; it includes sheep dog trials, sheep shearing demonstrations and arts and crafts. There has been a community here for centuries as Llandovery is in the shadow of Llanfair Hill which is the site of a Roman fort known as Alabum. The Normans also made their presence felt here, constructing a castle in 1110. The stronghold changed hands many times in the intervening centuries. A 16-foot high stainless steel statue to Llywelyn ap Gruffydd Fychan is located on the north side of Llandovery Castle, overlooking the place of his execution six hundred years earlier. Llewellyn led the army of King Henry IV on 'a wild goose chase' under the pretence of leading them to a secret rebel camp and an ambush of Glyndwr's forces.